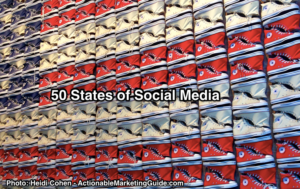 To celebrate the Fourth of July, America’s birthday, we’re giving you 50 social media tips. One social media tip for each state of the union. This way you can be a bright star on social media showing your rocket’s red glare. I’m sure you’re using social media for business. That’s a no brainer. The marketing challenge is: Are you being strategic is your social media use? If you’re like many marketers, you’re probably not sure. Social Media Examiner research revealed most marketers have trouble calculating social media ROI. This means that you have to figure out how ensure that your social media contributes to your bottom line. Keep reading and we’ll show you have to improve your social media effectiveness and results. 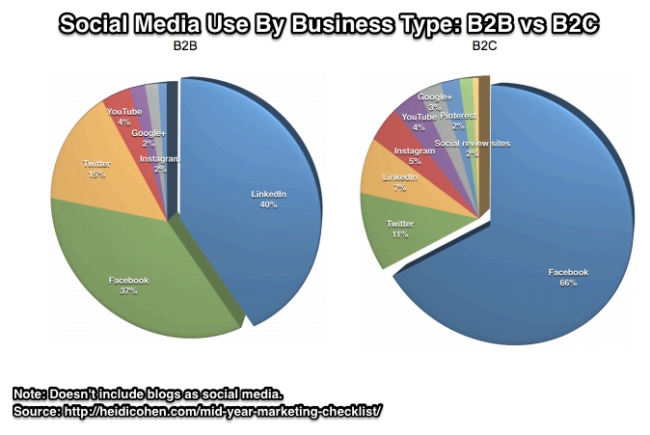 Here’s how marketers use social media based on Social Media Examiner’s 2016 research. Why are you using social media? Specifically What is your social media goal? what are you trying to accomplish. The major goals tend to include build your audience, expand your reach, extend your reach, develop thought leadership, and provide customer engagement and support. Who is your social media audience? To this end, create a social media persona for each of your major customer segments. What will you post on social media? This should be closely aligned with your content marketing strategy and related editorial calendar. Plan to reformat content for specific social media platforms. Don’t forget to curate other people’s content and engagement. When will you post on social media? It helps to know when your audience is active. Will you have special social media hours to interact with your followers? Where will you interact? Face it you probably have limited budget. You need to consider where your audience spends their time. 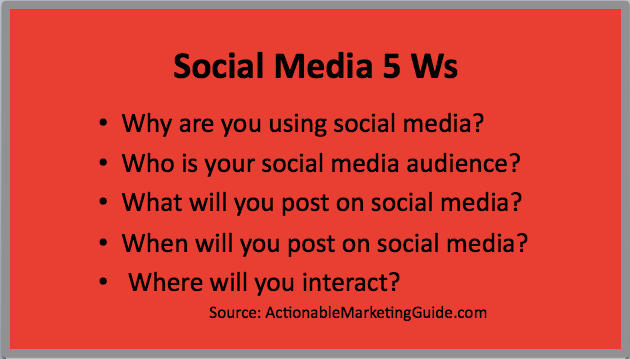 Once you’ve considered these 5 key questions, create a social media strategy. Your goal is to ensure that your social media activity yields quality for your followers and results that contribute to your business. 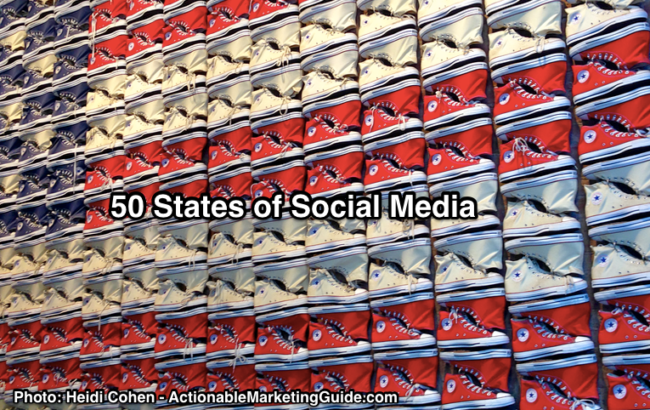 To help you improve your social media use, here are the 50 States of Social Media. This is our way of celebrating the Fourth of July with you. 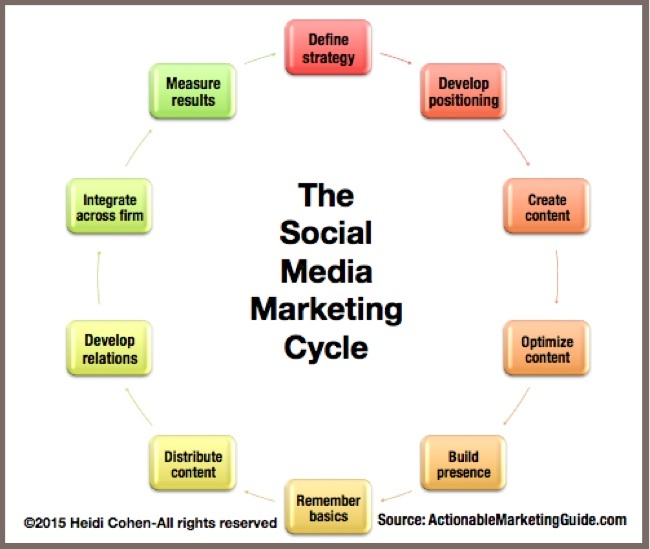 Here’s a bird’s eye view of how your social media marketing should look. If you’ve been using social media for a while to support your marketing, it’s a good idea give them an update. Goal: Ensure brand and message consistency. Audit your social media presences across platforms. If you’re part of a global corporation, this may be a difficult process. Each location may have its own presence. The objective is to list every social media site, track their location, names and visuals. Determine how you want your business presented on social media. Your goal is to be consistent yet relevant to each platform. If you don’t have branding guidelines for social media, create them. Include brand images, logos and other messaging. Set objectives for your social media activity. What are you seeking to achieve on social media? Where will you send visitors to on your site? Do you have targeted landing pages for your social media visitors? Decide the focus of your social media content. What do you want to be known for? How does this relate to your content marketing? What other companies are active in this category? How do they relate to your competitors? Have a strategy for social media content curation. You can’t use social media as a promotion platform. You’ll lose your fans. Give credit to others where appropriate. Don’t copy other people’s work. Create a business page or profile on major social media platforms. Use Facebook, Twitter, LinkedIn, Google+ and Pinterest. Determine when you’ll be active on social media. You can’t just set it and go. Who will be responsible for content distribution, engagement and office hours (including customer service.) Don’t forget time zone differences. Create social media guidelines for how your employees can communicate on social media with regard to your business. I recommend having a set of social media guidelines. If it’s not documented, don’t assume your employees will know the right thing to do. Decide who will represent your business on social media. Will you allow all of your employees to participate? If so, do provide special training to ensure they know your expectations? Promote your social media presence. Let people know where they can connect with you on social media in your emailings, blog, on business cards and other places online and offline. Qualified User Generated Content – With examples! Assess your blog. Check your blog is visually consistent with your brand and messaging. Audit your blog content. Is your content aligned with your content marketing mission and strategy? Is your content focused on your keywords? Is there content you can update, republish or delete? Integrate your blog content with your content marketing and social media editorial calendars. 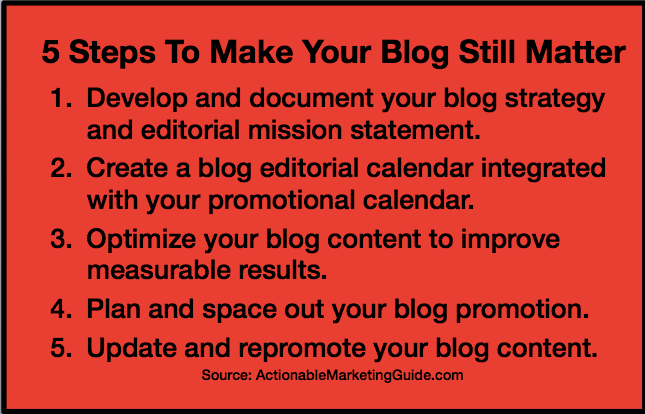 Your blog should be at the core of these efforts. Determine responsibility for your blog content and how it fits into other efforts. Mobilize your blog. Make sure it renders well on a smartphone or tablet. 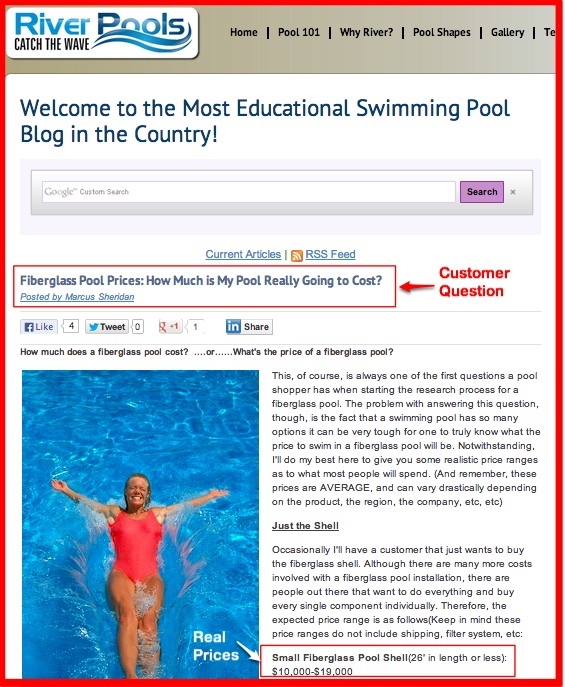 Format blog content to maximize readership. This means a great headline, strong introduction, quality points and a conclusion that gets readers to act. Include images in every blog post. They attract attention. Also include data graphics, videos and presentations. Make the images Pinnable. Show prospects how to use your products in blog posts. Kraft built its blog based on providing recipes. 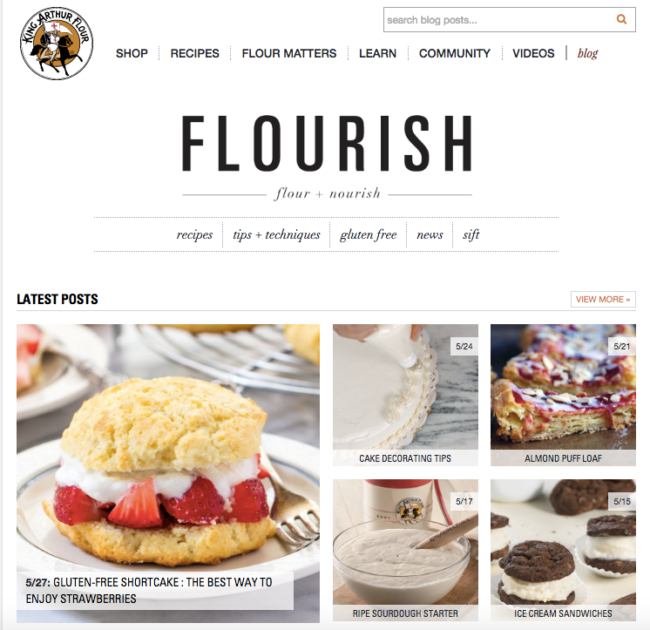 Personally, I love King Arthur Flour’s Flourish blog. Create on-going, recurring columns to attract an audience. Think like a magazine or newspaper. Reference influencers and give them credit. This helps expand your audience. Orbit Media’s Andy Crestodina calls this borrowing influence and audience. Interview influencers. You can do this one-on-one or as a group panel. I did this last year to support Content Marketing World. Add a podcast. This attracts a different type of audience. Michael Stelzner of Social Media Examiner believes that this is the media format of the near future. Include it in your blog. Incorporate Use Click-to-Tweet. This makes data points or quotes easily tweetable. This encourages sharing of your blog posts. Create a Pinterest board to share your blog content. Take advantage of the post’s long tail. Hat tip: Peg Fitzpatrick. Slice your blog post into a set of tweets. This allows you to share your blog post differently over time. Don’t just promote your content on the first day. Respond to blog comments. Every blogger wants comments. By responding to each one with a thoughtful answer, you’ll double the number of comments and encourage others to join the conversation. To maximize your social media effort you need to think automation and batching. To the extent possible, create your visual content at the same time. Social media sites like Facebook, Twitter, Pinterest and Instagram are image magnets. Use images to convey your message. Want some visual marketing advice from the experts? Then check out Peg Fitzpatrick, Rebekah Radice and Donna Moritz. They’re my go-to people. Create all of your social media images in batches. This minimizes content creation time. If you’ve got other content or marketing initiatives, include this creation in your plans to minimize cost. Make sure you have the different sizes or your images won’t shine. Incorporate hashtags into your social media shares to extend your reach. Show customers how to style your product. Customers seek information regarding how to use your offering. Use blog, Facebook, Pinterest and Instagram to strut your stuff. Share photographs related to your business. Think behind the scenes and #ThrowBackThursdays. Make it fun. Spotlight your customers on social media especially Facebook. Alternatively, you can get them to share their photographs of your product. This works well for crafts. Respond to customer questions. This works well on Facebook and Twitter. Let customers know if your hours. Follow relevant influencers. Re-share their content and build relationships with them. It signals that you’re interested. Tip from Mark Schaefer: Assign different influencers to members of your team. Schedule a photo day. Get a professional photographer to take your employees’ photos. Plan ahead and have costumes for different times of the year. Use a social media scheduling tool to batch your social media shares. Again this is another way to minimize creation time. You don’t want your social media content to be once and done. Have a social media advertising budget. Support your social media activity with an advertising investment. This is particularly important for Facebook. Need help? Read Jon Loomer’s blog. He’s the go-to guy for Facebook advertising. Social media continues to evolve making it challenging for marketers to stay on top of the latest changes on every platform. Therefore it’s a good idea to follow the platform experts. Participate in a Twitter chat. Show t you’re a member of the community. This is a time to interact with others in real time. Start a Twitter chat. This is useful to help build your thought leadership. Understand that it can take time to gain momentum. Write reviews for former colleagues on LinkedIn. Again, pay-it-forward. Join LinkedIn Groups to expand your network. Become an active participant. Share presentations on Slideshare. This is useful for businesses as well as solopreneurs looking for work. Bear in mind Slideshare isn’t only for presentations! From a business perspective, you have to assess your organization’s appetite for rougher looking live video. 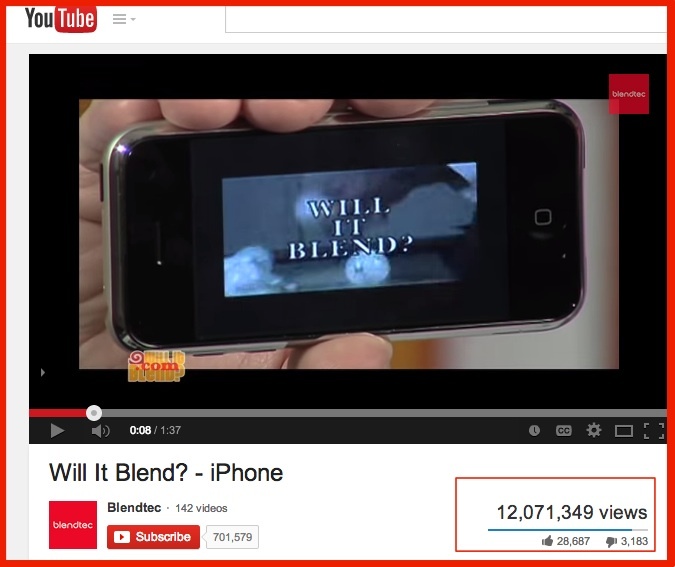 Otherwise video can be an expensive investment relative to text and visual content. That said it’s established brands like Blendtec (Will It Blend) and Orabrush. For live video, check out Mari Smith on Facebook Live and Kim Garst on Periscope. Put yourself in film—well, at least video. Start a YouTube channel. Test out other options like Periscope and Snapchat. Interview experts on video. Think influencer marketing. Post these videos on your blog and on YouTube. Tap into other people’s video series. Like podcasts, it’s a great way to test the waters. Depending on your business, you may have to think beyond the social media basics (Blog, Facebook, Twitter, LinkedIn, Google+, Pinterest and Instagram). Monitor ratings and review sites. Think Yelp, TripAdvisor, Amazon and Appple. While not formally social media, they provide public interaction and sharing. Additionally, they’re often entryways for your products. Use targeted social media platforms, where appropriate. Depending on your interests or business focus, niche social media venues can be very useful. My favorite is Ravelry, a community dedicated to knitters, crocheters and spinners. Go though this list of 50 social media tips. Take the time to assess your social media marketing plans. Your goal is to make your social media marketing yield better results. To help you achieve your business goals, use social media to connect with your prospects, customers and influencers. Remember there’s someone at the other end of your communications. Treat them nicely. What other social media tips would you add to this list and why? Photo Credit: Heidi Cohen – ActionableMarketingGuide.com (Note: You may use this photo if you link back to this article. Tags Andy Crestodina, Ann Handley, Donna Moritz, Ian Cleary, Jon Loomer, Kim Garst, mari smith, Peg Fitzpatrick, Rebekah Radice. Bookmark the permalink. Thanks for the greats tips Heidi, the B2C social media marketing is truly an essential sector to concentrate now, owing to the growing population of users and shoppers. Thanks a lot for your article ,Very useful. Thanks for sharing this Heidi. Great to read and good tips.